My sweet tooth is at an all-time high each year around Valentine’s Day. It’s hard to resist baking up a storm when your confections involve heart-shaped cookie cutters and pink icing! While chocolate is traditionally a favorite this time of year, I decided to mix it up with something a little more tart. LaurenConrad.com resident baker, Lauren Lowstan, helped me whip up the perfect combination of sweet and fruity: two jam-filled cookie recipes inspired by Valentine’s Day. 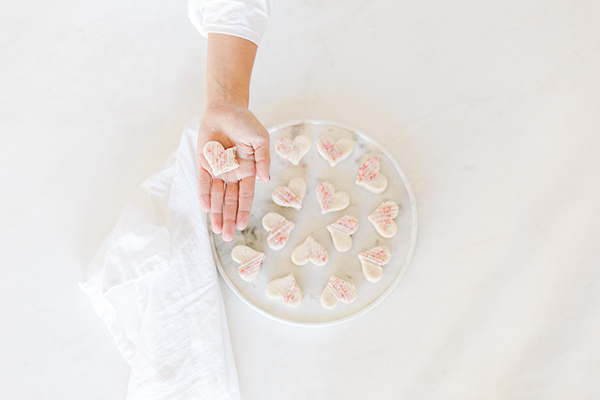 Trust me when I say that these bite sized morsels are hard to resist (and will definitely have your sweetheart coming back for more). In a bowl fitted with a stand mixer, beat butter and sugar until creamy (about 2 minutes). Add in vanilla and mix until incorporated. Add in the flour and salt and mix just until it comes together. Shape dough into a disc and wrap in plastic wrap. Place in the refrigerator for 30 minutes until the dough is chilled. Roll out the chilled dough until it is about 1/8 inch thick. 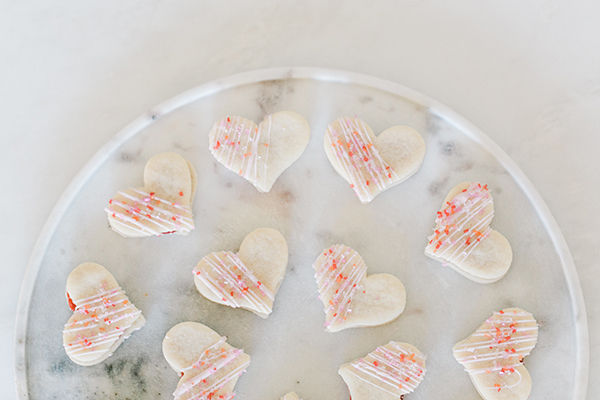 Cut out heart shapes until all of the dough is used. 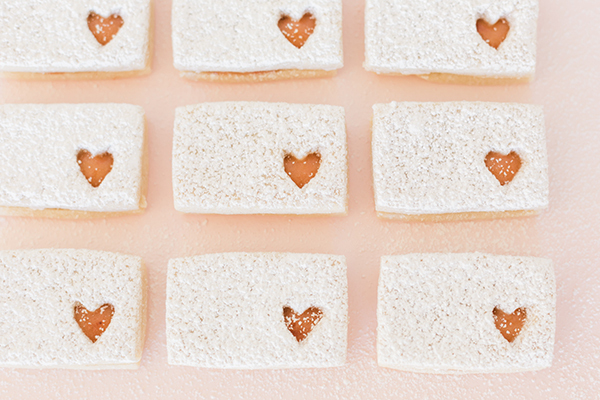 Place hearts onto a parchment lined baking sheet. Bake in a 350 degree preheated oven for about 6 minutes. You do not want your cookies to brown! Add the strawberry jam into a small piping bag. Flip half of the heart cookies upside down. Pipe a small amount of jam into the middle of each flipped over cookie. Try not to add too much jam or else it will spill out of the sides. Top each cookie with another and gently press together. Melt the white chocolate in a microwave in 30-second increments. With a toothpick, add in the tiniest amount of food coloring. A little goes a long way, so be careful when adding! Add the colored white chocolate to a small piping bag, and drizzle over half the cookies. Immediately top with colored sprinkles. You will also need a ruler for these cookies! Shape the dough into a disc and wrap in plastic wrap. Place in the refrigerator for 30 minutes until the dough is chilled. While your dough is chilling, prepare your lemon cream. In a glass bowl, whisk the sugar, egg, and egg yolk until smooth. Next, whisk in the lemon juice, zest, and melted butter. In one-minute increments, cook the mixture in a microwave stirring after each minute. Cook until the mixture is thick enough to coat the back of a metal spoon. Remove from the microwave and stir in your jam. Place plastic wrap directly on top of the cream and refrigerate it until completely cool. Roll out the chilled dough until it is about 1/8 inch thick. Using a ruler and a knife cut out the dough into 2.5 x 1 inch rectangles. 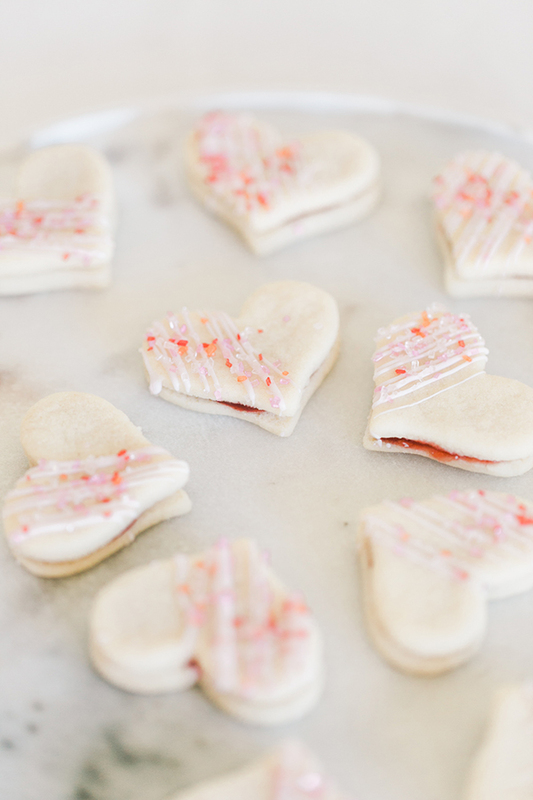 With your mini heart cookie cutter, cut out hearts in the right hand corner of each rectangle. If you can’t find a small enough cutter, you can cut out a heart shape with a small pairing knife. Just make sure to outline the heart shape with a toothpick, and then carefully cut the heart out! Place onto a parchment lined baking sheet and bake in a 350 degree preheated oven for about 8 minutes. Flip over all of the non-heart rectangle cookies. 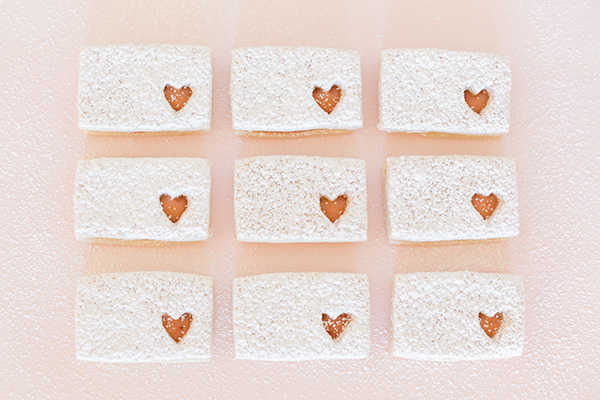 Sift powdered sugar on to all of the heart rectangle cookies. Add your lemon cream to a small piping bag, and pipe a small amount of cream just into the center of each cookie. Top with a sugared rectangle and gently press down. And there you have it! 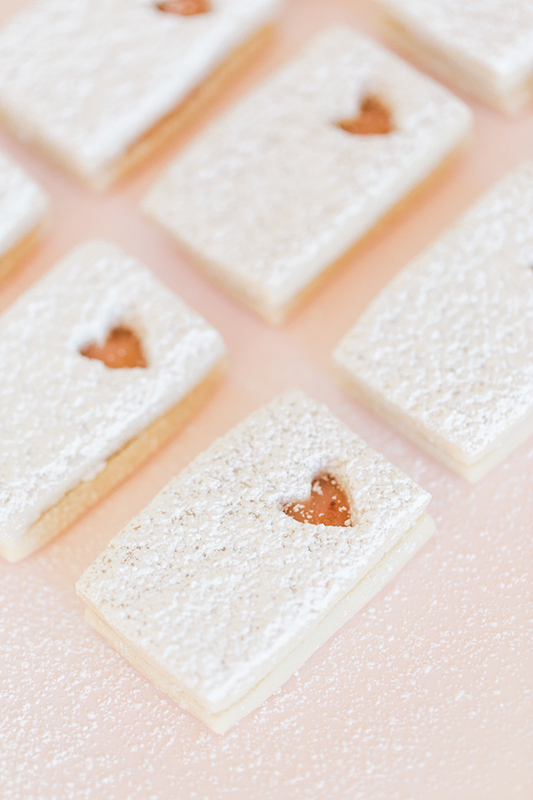 These cookies were a fan favorite at our last LaurenConrad.com photo shoot. Who can resist a dessert in the shape of a love letter?